This guitar wiring is very similar to the previous one (Guitar wiring for metal maniacs), which is designed for guitars with only one, high output pickup, made to play rock/metal. This is just a 'two pickups version' of it. This kind of simple wiring is not smoothing the sound, so it's a perfect distinct, distorted tone maker. It will allow you to make the tone more crisp and percussive, just by one click. It's something useful for fast palm-muting, or screaming solo play. All you need to make it, is push-pull 500K potentiometer and some resistor. As you can see, the push-pull switch is used to connect the resistor with the potentiometer and grounding (metal pot case). When the resistor is connected between third pot lug and the grounding, resistance is increased – we have potentiometer resistance and resistor resistance on the line. When we will use 300k Ohm resistor, we will get 800k Ohm (500+300) here, so for the whole wiring it will be working like one 800K pot. You need to know, that higher value of the pot means a higher treble peak in the signal. 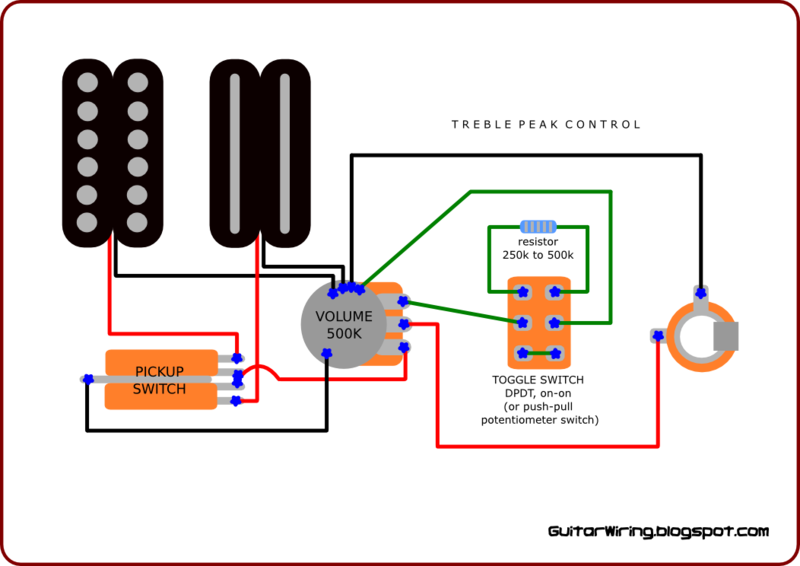 This is the way, how this wiring can add some treble to your tone, just by one click of push-pull pot switch. When you will be playing on „the high treble peak” (with connected resistor) you will not be able to dump the signal completely. There will be some sound, even when the volume pot will be turned down to „0”. So, for some swell effect or volume-off, it's better to switch off the resistor. Disconnected resistor will not affect the signal, so it's a very advantageous mod.